Do you have a leaking metal roof on your commercial property? Replacement is expensive, so why not consider a more economical alternative – metal roof restoration. Restoring your metal roof is a great option opposed to replacing your roof. Because of the way they are designed, metal roofs will eventually fail. Seams and fasteners are the 2 biggest reasons metal roofing systems fail. You can get your metal roof back close to its original state with our commercial metal roof restoration system. Affordability and quality are the standards we adhere to. Our main feature, technically superior coatings, applied after we’ve sealed any open seams and leaks, is one way that we’ve raised the bar for commercial metal roofing. If you’re looking for color retention and protection from extreme weather elements, our coating is what you need. They are Energy Star rated, backed by long term system and material warranties and choices like Cool Roof and bright white reflective colors. 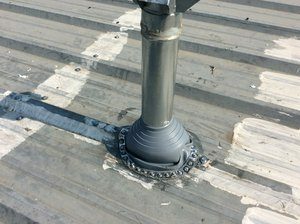 If you have fasteners and screws that are exposed to the weather, they are all potential areas for failure on a metal roof. A rubber washer is installed with the screws to help keep moisture sealed away from your interior. These washers will eventually get cracked and brittle as time goes by, allowing water to get through them and into your building. For metal roof restoration and metal roof repair, the waterproofing process is similar. If you’re just getting your roof repaired, you are only waterproofing the areas that are currently leaking, as opposed to treating the whole metal roof. Repair is a route to take if you don’t have the budget to do more, but you should still assess and inspect your entire roofing system to get an overall view of your problem areas. We have the ability to make temporary repairs if you don’t quite have immediate budget needed for a full blown metal roof restoration or replacement. The edge of each sheet of metal is a possible problem area because metal roofing systems are installed in separate sheets. The individual sheets can allow moisture to be blown up and in between them by high winds, allowing it to enter your property. When a metal roofing system is initially installed, a sealant is applied between them to keep this from happening. However, as time goes by, this sealant will deteriorate and allow water to penetrate between the sheets. 1 – Scrutinize the options for silicone products that your metal roof repair contractor might recommend. Metal roofing systems are not created equally. Our installation process and material product selections are being continually improved so we are delivering the highest possible quality and best adhesion ability for our customer’s buildings..
2 – Silicone materials are environmentally friendly. They have longer life cycles and a lower VOC, which reduces the impact on the environment. You should compare figures from Energy Star products that are approved by your local quality assurance programs. 3 – Increasing your building’s insulation is something that would be a good thing to evaluate during this process. You can minimize the impact the extreme weather has on your interior by using our silicone spray to improve your building’s R-value. 4 – The roof coating that was installed originally has probably deteriorated and this is why you have this problem. Plain acrylic systems are not the best choice. You should choose a silicone product that has a history of better durability. Silicone is a better choice because it isn’t prone to washing off, needs less reinforcement, and doesn’t fade, haze or chalk. These features make it an excellent material for metal roof restoration. Taurus Elite Commercial Roof Systems 512-332-4422 provides commercial roofing services to Austin, Texas and the surrounding area. This includes commercial metal roof repair, commercial metal roof restoration, commercial metal roof replacement and commercial metal roof installation. We have been providing professional commercial roofing services to the area for over 20 years.